East Fork, at an elevation of 8,500 feet, is 1.5 miles from the North Slope Road Trail Head. The non-motorized trail to the yurt is a winding path on the East Fork Bench. It is a relatively easy trail that enables yurt users to haul extra goods and supplies. 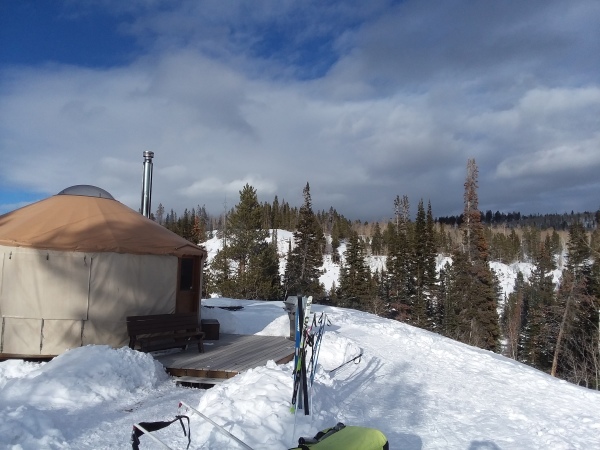 The yurt sits on the bench above the East Fork of the Bear River overlooking a large flat meadow below Dead Man’s Pass. From the deck of the yurt there is a stunning vista of 12,400 foot Mount Beulah to the southeast. The yurt is also a great summer stay as well. The yurt is a little more than a fly cast from the East Fork of the Bear River.